MENA New Energy is the Middle East & North Africa’s Largest, Senior Level Strategic & Commercial Renewable Energy Specific Conference & Exhibition. 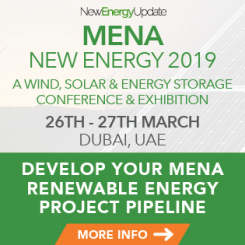 It is the event that will provide the pathway for wind, solar, storage developments and more in the MENA region, whether you are local, regional or international in focus. By attending you will meet key industry experts and executives from government, developers, EPCs, suppliers, finance and legal services, and off-takers.